Miniature roses, once a rare commodity, are now widely available and make excellent additions to any garden. They are versatile and can be grown as individual specimen bushes, edges and hedges, and of course in containers. They make wonderful accent plants in rock gardens as well as window boxes. In addition to being so versatile, they are hardy, fairly easy to grow and will thrive in a variety of climates and growing conditions. Special winter protection is not needed for miniature rose plants grown in hardiness zones six through ten. Well adjusted, healthy plants will most likely survive the winter. If you live in the more northern zones, a good mulch, properly applied, is usually enough to help them survive the winter. This means that you should be able to grow miniature roses just about anywhere. Most roses, including miniatures bloom in constant cycles from spring to the end of fall, your miniature rose plants will look beautiful throughout the entire growing season. Miniature roses are available in many varieties, although not quite as many as regular sized roses. The colors, however, run the same spectrum as full sized roses. 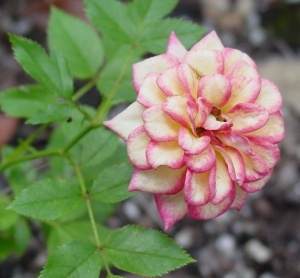 The individual bloom is usually no more than 2 inches across, but miniature roses grown close together in groups of three or more create a riot of color within tightly leaves. Just like other roses, most miniature roses need a great deal of sunlight and water. While there are some shade tolerant varieties, most need five to six hours of sunlight per day. You can determine whether or not your miniature roses are receiving enough sunlight by looking at the leaves. Miniatures that do not get enough light have wide spaces of stem between the leaves. In miniature roses it is natural for the leaves to be close together. The one drawback (if you can call it that) is the fact that the majority of miniature roses have little or no fragrance. However, if you shop around, you will find some few that do have the traditional scent of standard size roses. Nevertheless, miniature roses can be a worthwhile addition to your garden. They are easy to grow, easy to care for, and are extremely hardy in a variety of growing and climatic conditions. In addition, there are many varieties available that are resistant to disease and insect pests. No matter what kind of garden you have, it is possible to incorporate these small gems into its design. They are among the more versatile of plants, and they are a delight to behold, blooming in cycles so that you nearly always have beautiful flowers.